Blog Travel Colorado Rocky Mountain N. P.
Rock Cut at the top of Trail Ridge Road, Rocky Mountain National Park, Colorado. Janine has been working very hard to update our website with our new photos from this past fall, and we now have the first of what should be many updates over the next couple of weeks, and that is a new section of Rocky Mountain National Park photos, along with a sub gallery of Estes Park photos. Sunrise, Moraine Park, Rocky Mountain National Park, Colorado. We are done converting and adjusting our photos from our end of summer and fall travels, and we should be updating our website soon, including a new section on Colorado. Until then, I thought I would share a few more photos from that trip. Sharp eyed viewers might spot the bull elk. I promised to start adding the settings for each photo, and then proceeded to forget on the very next post. This was 6 seconds at f/18 and iso 100. I don’t remember, but I’m guessing I used a two stop soft edge graduated neutral density filter. 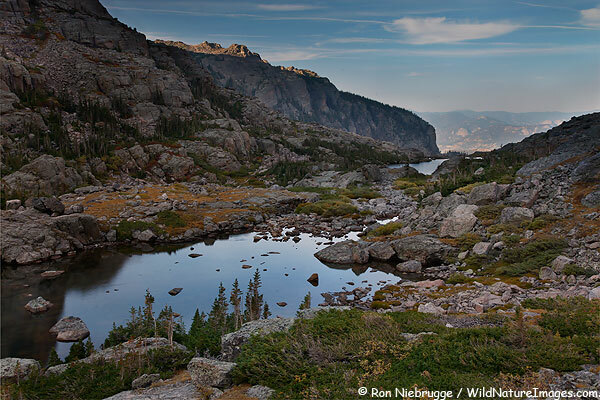 See more Rocky Mountain National Park pictures. 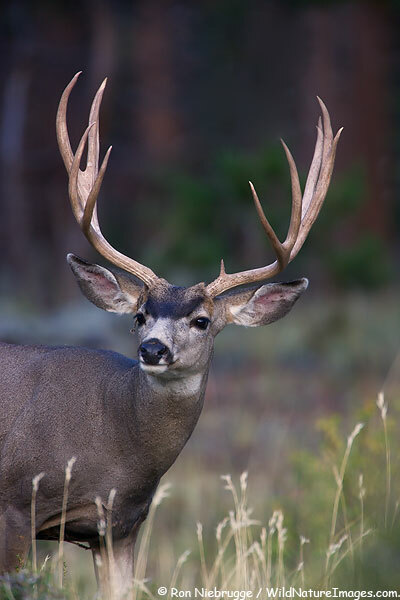 Mule deer buck, Rocky Mountain National Park, Colorado. This guy was huge! 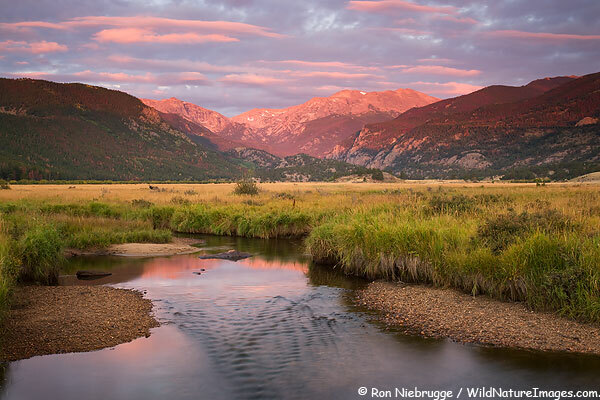 Rocky Mountain National Park is sure a great place to watch and photograph elk and deer. This was from our Fall visit. Here are more Colorado photos. 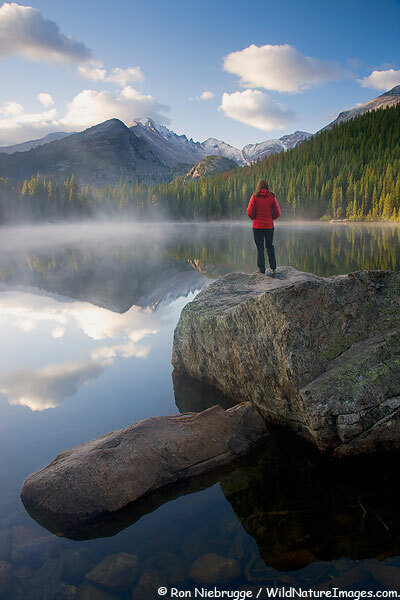 Janine at Bear Lake, Rocky Mountain National Park, Colorado. I then remembered submitting my blog to Amazon about a year ago and having to wait for approval. If they emailed back, I missed it, and completely forgot about it. I don’t remember the details, but I get some percentage of that dollar, probably not enough to retire on. 🙂 It wasn’t about the money, I viewed it as another nice new way to subscribe to the blog. This summer we sat next to a nice lady on one of our flights who showed us her Kindle, those things are really cool – and very easy on the eyes, nothing like a computer screen Now admittedly, my blog relies far more on colorful photos then words, and I don’t know how those will translate to the black and white screen. But, they do offer a free 14 day trial so there is nothing to lose. If you do get a Kindle for Christmas, check it out, and let me know how it works! I haven’t mention it here before, but along with a handful of Alaska photo tours, I am now also offering private one-on-one workshops and tours. With a private tour the instruction will be tailored specifically towards your needs and interests. It can be anything from working on composition and exposures in the field, to using Photoshop in the office, or maybe a combination of topics. I will travel anywhere for these workshops, they can be here in Seward, your town, or at a favorite destination. Click on the link above for details. As you can see, the fall colors in the high elevations are beginning to change nicely – this was from Saturday morning. The lower elevations still have a lot of green – if I had to predict, I think this upcoming week will be a lot better with next weekend possibly being the best. Monday’s predicted cold front could add some nice snow on the mountains and could speed the change up a bit. I’m getting excited for the fall colors! 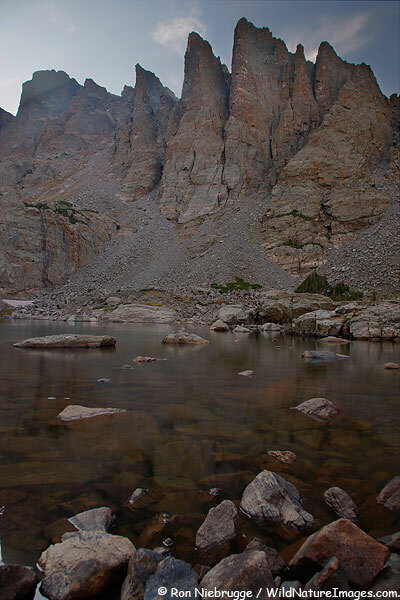 Rocky Mountain National Park, Colorado photos. Sky Pond, with Lake of Glass in the distance, Rocky Mountain National Park, Colorado. Our original plan was to spend the night in this beautiful setting, but Park rules don’t allow back-country camping in this area. There is a single back-country campsite about two miles from here, but it had been booked long ago. So, we hiked up, waited for a sunset that never developed, and then hiked out with the last three miles by headlamp in the dark. Although we couldn’t spend the night, it was still a great trip! 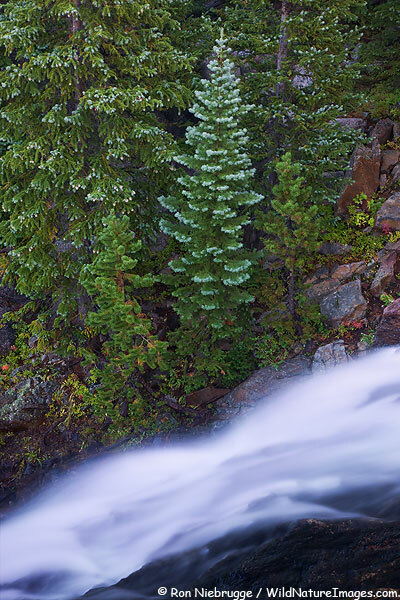 By the way, the waterfall in yesterday’s post, Timberline Falls, is just below the distant lake, Lake of Glass. I have come the conclusion that hiking in the dark is not that much fun – you miss out on the scenery as you stare at the dirt and rocks in your light-beam five feet in front of you for boring mile after mile – I begin to feel like I’m driving. And, even through it seems like you are going fast, we have found we are a bit slower in the dark. But, had there been a great sunset, it would have been so worth it. Actually, it was worth it anyways. Sharktooths rising above Sky Pond, RMNP, Colorado. To this far side of the lake was about a five mile steady climbing hike to almost 11,000 feet. Just as I was feeling pretty good about how quickly we made it to this high country destination, I noticed 4 people repelling off one of the Sharthtooths! Geeze, our hike was probably barely a warm up for them. The top photo was .8 of a second at f/14 and ISO 100 and a polarizer and two stop graduated neutral density filter. The bottom image was a blend of two photos, one for the sky, one for the rest. 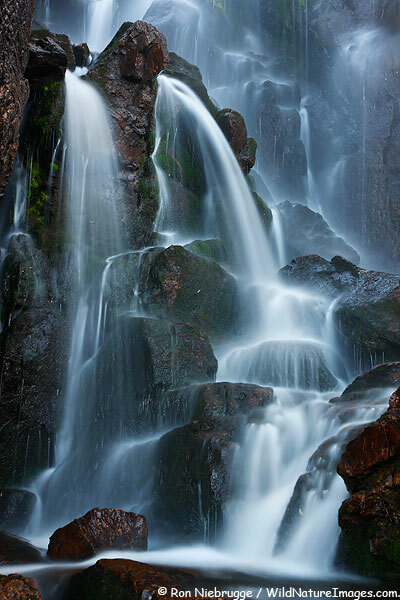 Timberline Falls, Rocky Mountain National Park, Colorado. This cool waterfall is on the hike to Sky Pond – more on the hike tomorrow. 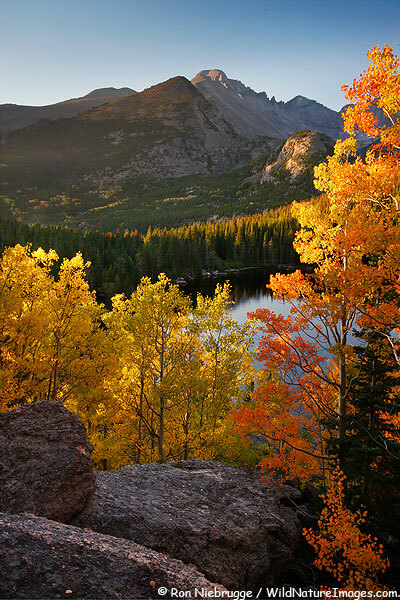 Check out more Rocky Mountain National Park, Colorado pictures.